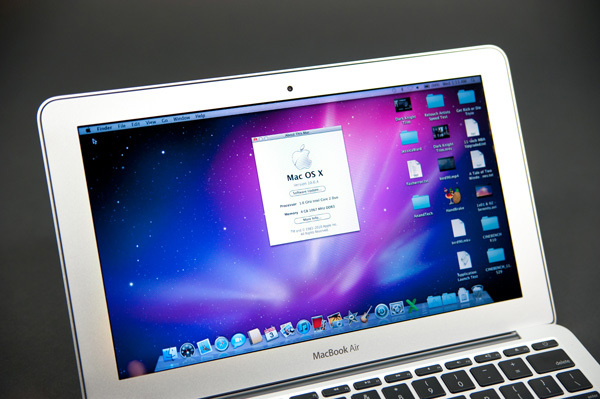 Apple's 11-inch Upgraded MacBook Air: Do 1.6GHz and 4GB Make a Difference? Last month we looked at Apple’s new 11-inch and 13-inch MacBook Airs. I concluded the 11-inch was the pinnacle of portability, delivering the weight and form factor of a netbook but without the drive-you-crazy performance of an Atom. The 13-inch was more of a regular, get-your-work done notebook - just in a very thin and very light chassis. I liked carrying the 11-inch MBA, but I liked working on the 13-inch. My typical workflow was simply too slow on the 1.4GHz 11-inch system. Apple offers two potentially important upgrades for the 11-inch MacBook Air that could alleviate some of my concerns. For $100 more than its $999 starting price, you can outfit the 11 with 4GB of memory instead of 2GB. Light web browsing and writing don’t need more than 2GB, but start editing videos, photos or open way too many apps at once and you’ll quickly want more memory. If you’re planning on keeping your system for a while, the 4GB upgrade makes a lot of sense. And many Apple stores actually stock the upgraded 4GB model. The next upgrade is a bit harder to swallow. The base 11-inch MacBook Air can’t be upgraded aside from memory. The $1199 model however, can. You get a 128GB SSD (up from 64GB) as well as the option to pay $100 for a 1.6GHz Core 2 Duo. Normally 200MHz isn’t much to write home about, especially not for $300 more than the standard 11. However, 200MHz is a 14% increase in clock speed compared to the base model. In applications that are CPU bound, you may see close to that percentage in improved performance. The magic number for feeling a performance increase is 10%. Anything below that is tough to feel in real world use, but anything at or above that 10% mark usually feels quicker. Dimensions 11.8 " x 7.56 " x 0.11 - 0.68"
(29.95 cm x 19.2 cm x 0.3 - 1.7 cm) 11.8 " x 7.56 " x 0.11 - 0.68"
(29.95 cm x 19.2 cm x 0.3 - 1.7 cm) 12.8 " x 8.94 " x 0.11 - 0.68"
Combine the two upgrades and you’ve got a fairly expensive MacBook Air ($1399 if you’re keeping score). But if you want the portability of the 11 and are looking to get as much performance as possible, it’s your only option. Luckily we happened to come across such a system. And we didn’t hesitate to test it. Apparently during the battery tests, the hard drive is allowed to sleep if idle...? So... always? or never? Is it like dividing by zero? Frankly, I don’t expect to pay less for an ultra-portabl than a regular notebook. Note that the original MBA started out higher than this upgraded machine, and the competitors that followed with the SFF LV C2Ds were just as expensive, if not more. Who else is using the ULV C2Ds from Intel? These new MBAs might be new, but these chips aren’t new. The closest competitor seems to be the Sony Vaio X that started at $1300 (and $1500 if you wanted gold colored plastic), but coincidentally dropped their prices by $200 this past Monday, yet still more than the 11” MBA with a processor and IGP that cost 7x(?) as much. How can Sony justify an Atom Z550 CPU + GM500 IGP for that price when the bulk of the cost has been reduced to a $30 CPU and IGP. If you use the extended battery that puts it inline with the 11” MBA in terms of weight and usage, but not in terms of performance. Somehow no longer for sale from dell.com for some reason, was a month ago though. Refresh? Or the Vostro V13- even cheaper. In regards to the comparisons, I was looking for 11” ultra-portables with CULVs. I can’t find any, which makes me wonder how Anand can say the price is “a lot” when there is nothing to compare it to. If it’s just a personal thing, then there is a lot of history of ultra-portables that are vastly more expensive for performance making the 11” MBA the cheapest such machine he’s tested, that I can find. If you want to talk 13”, I like the styling of the Vostro but it isn’t close to the MBA. It starts with a single core Celeron and moves up to a 1.3GHz C2D. That is 1GHz less than the maxed out 13” MBA. Not to mention the size and weight. It’s an ultra-portable, I guess, but it’s not in the same class as the Adamo, MBA or now defunct Voodoo Envy. The first Adamo is a well engineered machine. I love the ports in the back. The 2nd design was very poor. There was no benefit to the user. They went thinner without adding functionality. » http://www.dell.com/us/p/adamo-laptops It does look like it even the first generation is gone. Hopefully they something else coming. And no light in the tunnel. From Intel anyway. For the sake of performance Sandy will not be much better than Clarkdale in the CULV space.